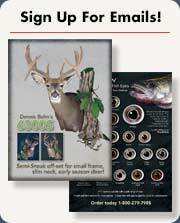 Taking the measurements of the animal properly ensures that you will be using the best form for that specimen. If you are adapting a form, the measurements that you take will help you alter the form to fit exactly. The "A"measurement is the distance from the front center of the nose to the bone on the inside corner of the eye. Use calipers to take this measurement accurately. With a ruler, your line of sight will vary greatly, and on average, this dimension is short by about 1/4 inch. The "B" measurement is the circumference of the neck at the throat and around the neck crossing the atlas of the neck. 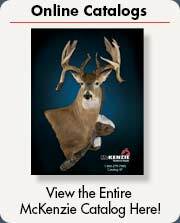 This measurement should be taken from the skinned carcass in the approximate position of the finished mount. The "C" measurement is the circumference of the neck tight to the head. 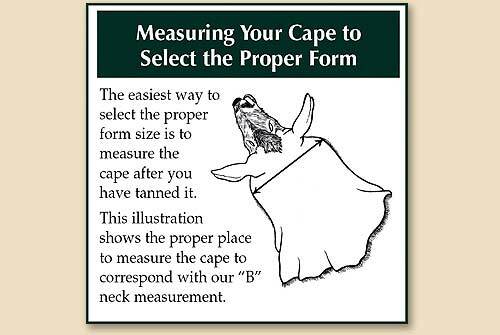 This measurement, as well as any other neck measurements, should be made after the skin has been removed. The "D" measurement is the circumference of the neck 3 inches down from the "B" measurement. The "B" and "D" measurements give a true representation of the amount of swell a neck might have. The nose-to-eye (A) and the neck circumference crossing the atlas of the neck (B) are the most critical, so are considered the primary measurements. The neck circumference tight to the head (C) and the neck swell line (D) are secondary measurements. "A" measurement is taken before skinning, all others are done afterward. 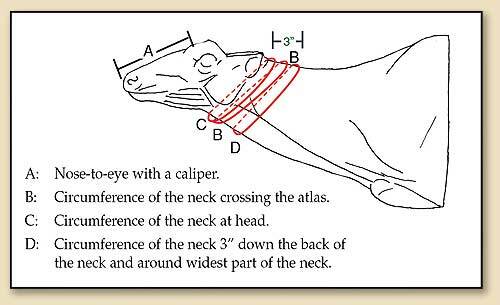 If you do measure the neck over the hair prior to skinning, you must deduct the hair and skin thickness from the measure (usually two inches or more, on average).